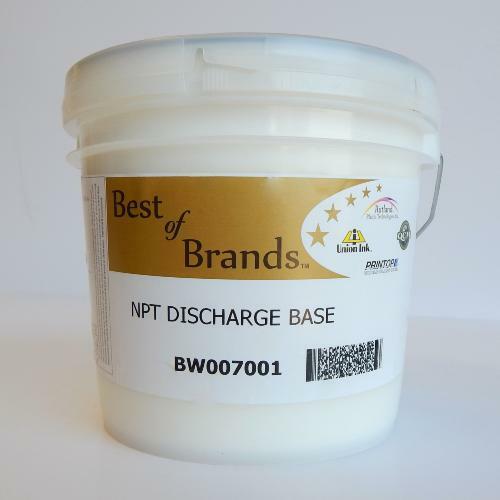 How To Properly Use Rutland NPT Discharge Base? Discharge printing is a process where water-based inks are applied to certain"dischargeable” dark coloured garments to produce very bright, soft prints. As the discharge inks are printed and heat cured, the original dyes in the garment are being reduced, or "discharged” from the image area. Rutland NPT discharge base can be pigmented to produce soft bright vibrant colours. Please note, discharge products like NPT discharge base from Rutland require 6% Discharge activator, and once mixed have a shelf life of 4-6 hours. The discharge products are formulated to work most efficiently on 100% cotton garments that have been dyed for specifically for discharge printing. Choose from One of our Pigment Concentrates to give your base a bit of colour. Pyramid Screen Products endorse best industry practice that operators should wear appropriate personal protective equipment (PPE) when handling all chemical products, even those classified as 'non-hazardous'. PPE for CPS Products includes gloves and safety glasses/goggles. You may also be interested in discovering Pyramid Ready To Use Water Based Inks & our full range of Screen Printing Inks.